The financial insights Charlie offers actually helped me save money. The problem many users have with budgeting apps is the time investment they require, both to learn and to use them. They become just another excuse to not manage your money. But Charlie is different. First of all, Charlie is not an app. 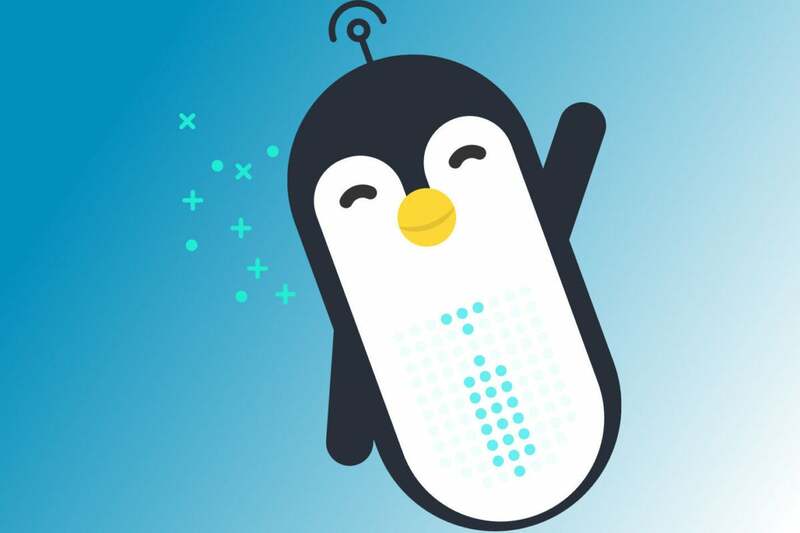 it’s a text-based AI assistant—anthropomorphized as cartoon penguin—you interact with using natural language. You merely ask Charlie question about your personal finances and it answers. Second, Charlie does all the balance-monitoring, number-crunching, and other burdensome budgeting chores so you don’t have to. Charlie provides insights and actionable advice to help you save money. All you need to do to enlist Charlie’s financial assistance is sign up by sending a message via Facebook Messenger or entering your mobile phone number on the Charlie website to start a text-based interaction. Charlie responds instantly, introducing himself and his capabilities, and prompts you to connect the bank or credit account you use for most of your spending. He says it can take up 20 minutes to sync with your account statements, but mine was up and running in under two. Once your account is connected, Charlie immediately tells you your current balance. He also offers to send you regular balance updates—either daily or weekly—or no updates at all, then confirms your choice. Like Trim, Charlie analyzes your transactions for recurring subscription charges with an eye toward cutting your expenses. Within minutes of signing up, it had pointed out that my Hulu subscription was costing me $96 a year (“That’s like almost a day at Universal Studios!”) and suggested I might consider cancelling it if I wasn’t watching it much anymore. But Charlie is much more than a bill-buster. It can handle just about any personal finance task you throw at it using conversational queries like “Show me my subscriptions” or “How can I save $200 dollars by Christmas?” In the latter case, Charlie informed me that all I needed to do was set aside $10 a week between now and December 25. It even set a reminder for me to keep me on track. Charlie keeps working for you even when you’re not actively interacting with it. 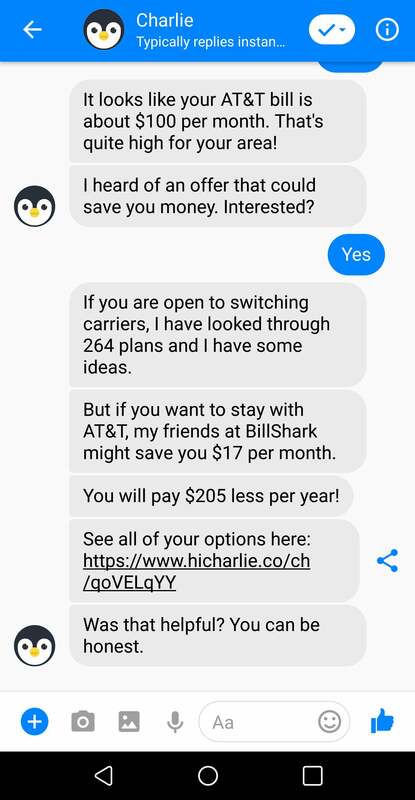 A couple of hours after I signed up, Charlie informed me that my $100 AT&T bill was high for my area, and offered me several options for lowering it, including having Charlie partner Bill Shark negotiate it down on my behalf. In addition to finding ways to save, Charlie can you help you set and keep to a monthly budget. Just tell it if you want to budget a particular category or your total monthly spending and name a dollar amount. You can ask Charlie to highlight spending trends, too, by asking things like “How much do I spend at Starbucks?” It will reply with your total spend for the last 30 days and compare it to the average spend for that category. Charlie can create a budget for you and help you stay on track. These numbers were generally accurate, but I did encounter some discrepancies. When I asked about my monthly grocery and gas spending, Charlie’s answers were about $900 under and $37 over, respectively, what I had logged in my regular budgeting app, You Need a Budget. Likely this has to do with the fact that I have insights Charlie can’t possibly guess, like the fact that I often pick up a few grocery items at Target in addition to my regular grocery store haul. I can, and do, manually assign that spending to my “groceries” budget, but an AI scanning my bank transaction for vendor names cannot. The convenience of Charlie is immediately apparent. Rather than having to log into my bank’s website or budgeting app to check recent activity or run a report, I could just pull out my phone and ask. That alone will make Charlie irresistible to a lot of users, particularly younger mobile ones. But the real value is in the insights and actionable advice Charlie provides around your finances, many of which will lead to real savings. That, after all, is what budgeting is all about. 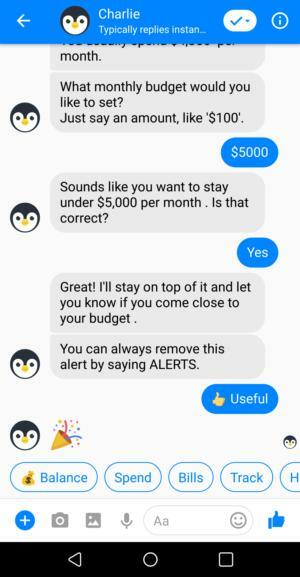 Charlie's AI advisor is an easy and enjoyable way to stay connected to your spending.